I want to show to my client the submissions but i don't want to allow him to can change my jotform. Is it possible? i created a form with jotform and out it on my site. I need to share with my client the submissions but i need he cannot change the form. Would you like to share with them all of the submissions as a preview or just their own submissions? If you would like to allow them to only preview the submissions, you could create a report and share the URL with them. I would suggest Grid Listing Report in that case. If you would like, you could also set them as your sub users and set different permissions for them. Now if you want to share all jotforms with your new sub user, you will see the options for that after clicking on the "create new sub user" button. The first thing that we notice is that we can fine-tune the permissions and allow them to do only what we want them to do. 4. Make them your sub user, show them the jotforms, but do not allow neither to edit jotforms nor to view submissions. Allowing them to see the submissions is useful if you have someone that helps in your daily work, but you do not want them touching or changing the jotforms you have by accident, such as data entry personnel, marketing, billing, sales, etc. 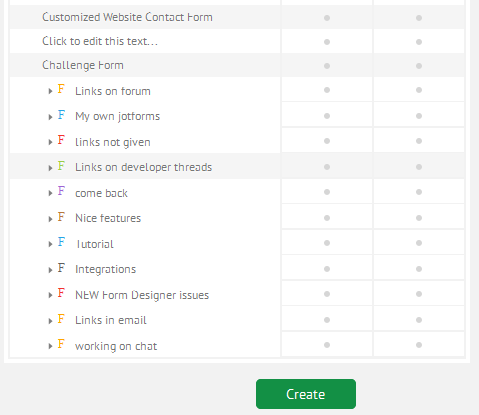 If you want to have someone assist you in creating jotforms and editing them such as a web designer or a web design company that you have hired, you can create the sub user and allow them to edit your jotforms, but not to be able to see that private data that you have received by your visitors. 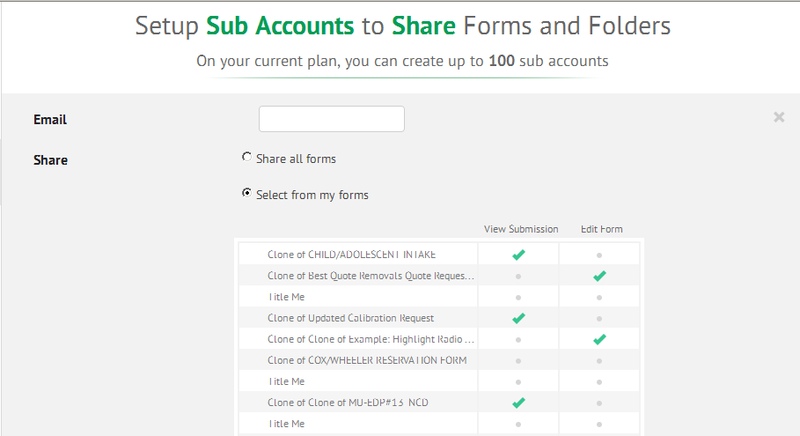 If you need to share your jotforms and submissions with your partner(s) in which case they would probably need to edit them as well, you can select both options. If for now you just want to add someone as a sub user, but are not sure what to allow them, leaving it empty should help you with that. Another option that we have is to set permissions per jotform. As you can see, in this screen it is easy to see exactly which jotform we want to share and how we want to share it. If we click on the dots in View Submissions column and Edit Form column, we would activate the permissions for the jotform to our user for both respectively. The allowed permissions are marked with a green checkmark as shown above. Now if you like to have things organized and have created some folders to help you with that, you can also set the permissions on entire folder, instead of doing it individually for each jotform in it. This also allows you to add new jotforms and have them instantly available for your sub user with the default permissions that we set to the folder (you can always change it for some specific jotform). Once everything is set just click on the Create button and voila :) You are ready to go.